CBC meteorologist Ryan Snoddon says while Michael will track just offshore, the region is still expecting a soaking of tropical moisture from the storm. 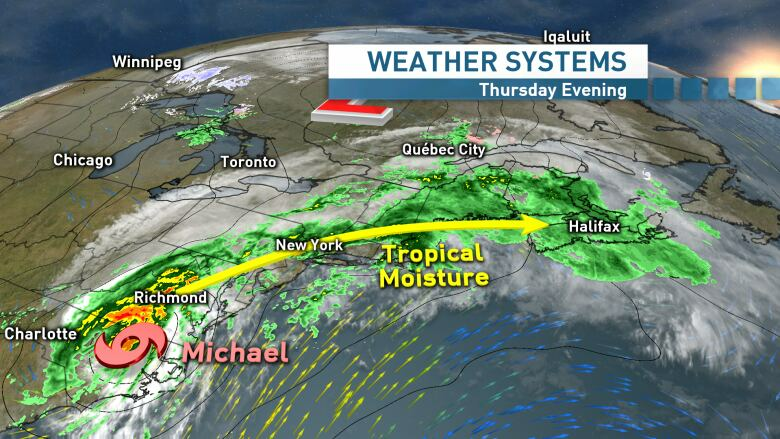 Tropical moisture associated with Michael is already tracking into the Maritimes and there's a lot more to come. Rainfall warnings are in effect for most of mainland Nova Scotia where 40 to 60 millimetres of rain is looking likely through Friday. Over southwest Nova Scotia and along the south coast, including Halifax, localized amounts could certainly top 60 to 80 millimetres or more locally. While this will certainly be a solid fall soaking, it could have been much more than that. 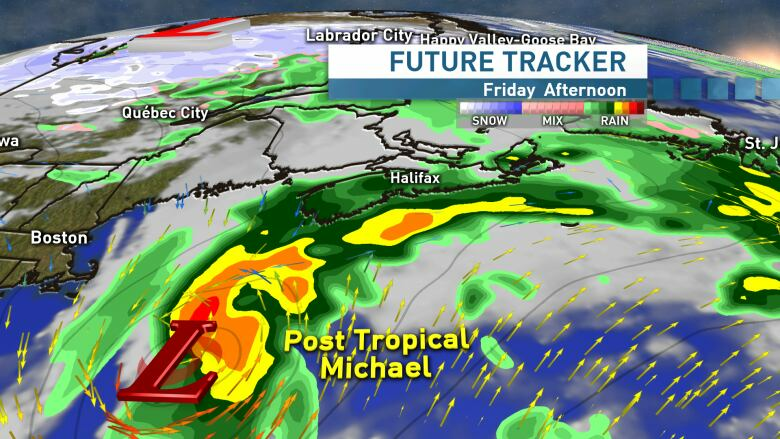 The track of Michael — soon to be a post-tropical storm — will be just to the south of Nova Scotia on Friday. As a result, the heaviest totals (100 millimetres or more) will be tracking just offshore as well. As I mention in the video above, the rain falling Thursday night is tapping into the tropical air mass around Michael and will be coming down at times heavy, especially overnight. I can't rule out a rumble of thunder over southern Nova Scotia. That tropical air will make for a very mild Friday across the province with temperatures into the high teens. While the rain eases through the day Friday, we could still see some heavy downpours, especially southwest Nova Scotia and the south coast, as post-tropical Michael brushes by just offshore. Some good news? 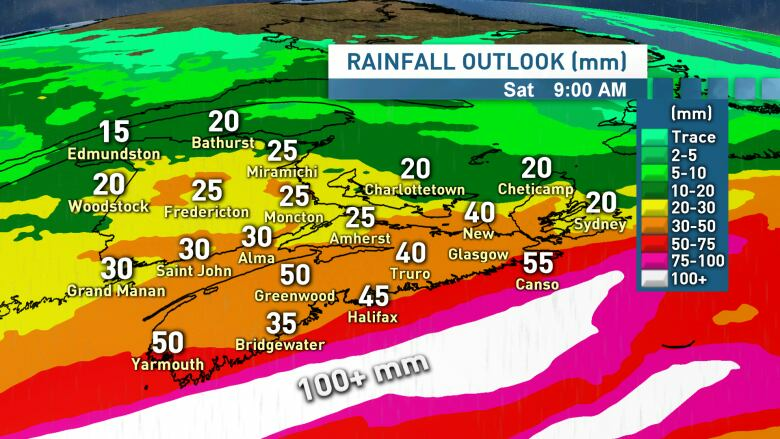 After all of this rain we're clearing out for what looks to be a pretty solid fall weekend across Nova Scotia. You can check out my seven-day forecast in the latest edition of CBC Nova Scotia News at 6 here. The forecast begins at 25:45. Keep up to date with our weather blog, updated every day. 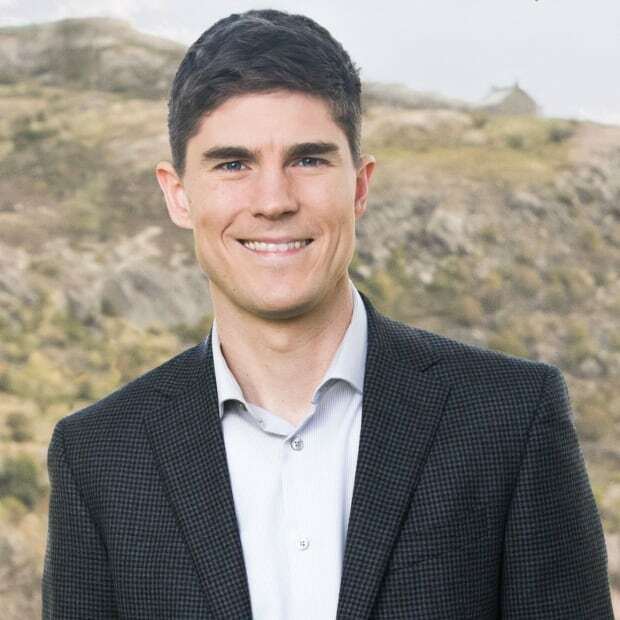 Ryan Snoddon is CBC's meteorologist in Nova Scotia and New Brunswick.